There is a soaked ten-year-old boy in ankle cuffs off in the corner. His motherâ€™s sobs can be heard through the walls of the room in which she is being questioned. My eyes are fixed on the scene, but my mind wanders. Will that be me in 20 minutes? A storm rages outside, and amidst all the chaos, my family sits in the pure white chairs in the pure white lobby in front of the pure white counter at the Texan border control center we are being held at. White had never before seemed soâ€¦dirty. 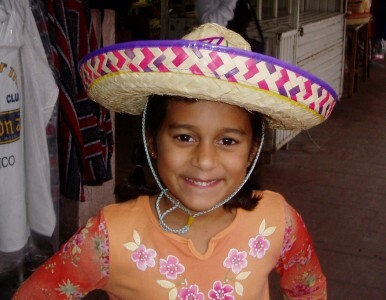 My sister, Aashna Tilve, playing around with sombreros in Mexico. What started out as a simple trip to Mexico had turned into a three-hour nightmare on the border. 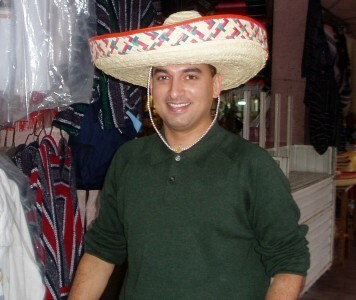 My family was in Texas visiting relatives, and we had thought that an afternoon in Mexico with my aunt and her neighbor would be an exotic adventure. And it had been. However, on our drive back over the border, the sky darkened. The patrol took one look at my fatherâ€™s dark skin and dull eyes and sent us off to the parking lot. We waited as they questioned us, one-by-one. Actually, thatâ€™s a lie. They questioned everyone not born in the United States: my mom, dad, aunt, and me. The Texan neighbor and my younger sister, the two American-born members, were left seated for the hours that we were cross-questioned. The documentable fact that we were all American citizens was deemed inconsequential. I had lived in New Jersey since I was one. Despite having American passports, quick internet searches showed that my parents and I had been born in Mumbai, India. Apparently that was enough to throw up a red flag, and we were outsiders once again. My dad, Umesh Tilve, testing out a new look. To be honest, we should have seen it coming. My family is one hundred percent Indian, and my father is stopped any time he tries to board a plane going to or coming from the United States. Heâ€™s a good sport about it. He respects the officials for doing their job, and he talks of the dozen or so incidents with a cheerful attitude and often, some laughs. Even that day, he was the most compliant, the most jovial. . I, on the other hand, was beyond frustrated. My dad, indeed, has dull eyes that make him seem menacing even though he is really a softie. The man cries while watching Love Actually. But if we were suspicious enough to be stopped, why were those with us not suspicious as well? First, they talked to my dad. Then, my mom, and lastly, they called me up to the counter. I was barely tall enough to see over the counter as the officer asked me questions. â€œHow old are you?â€ â€œWhere were you born?â€ â€œWhen was the last time you went to India?â€ â€œWho did you stay with?â€ â€œWhat did you do there?â€ Simple enough. I knew the answers, but the element of surprise was enough to have me shaking. What if my mind went blank? What if I answered incorrectly? What if I didnâ€™t remember the dates properly? My voice wavered as I responded, after which, I was sent back to my seat to wait an hour while my parents were fingerprinted like criminals. Why is it that only the foreign-born members of our party were questioned? Why was I, a seventh grader, subjected to frightful questioning while our 45-year-old white, male friend sits on the side? These are questions to which I have never found answers. They still make my blood boil, even seven years after the fact, but that seems justified to me because things havenâ€™t changed. This past summer, my family went down to Florida for vacation. In the security line at Newark International Airport, my dad was stopped once again. Story of our lives.